I’m *still* obsessed with underwater scenes! Not just the Copic ones from Underwater Scenes class. But watercolor too! 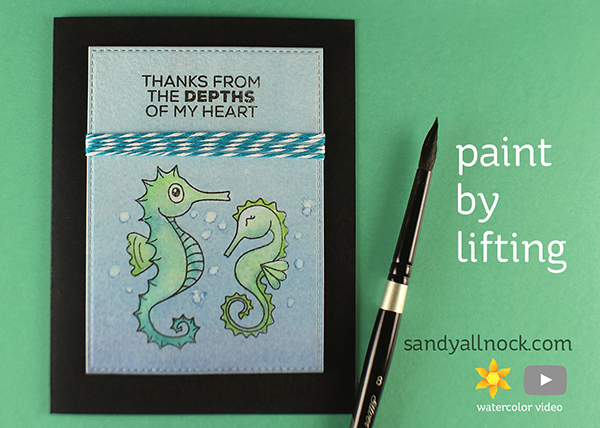 I keep buying any underwater stamp I see….and these sweet little seahorses just needed to end up in my studio. I love the range of sentiments on them too. Watch the video below or click HERE to see it in HD on YouTube. The twine here is very old, I don’t even know who made it – but I decided to keep the card really flat and make just a mini panel of twine that could be taped on the back. No lumps for mailing! This project is super adorable!! Wow, Sandy I almost forgot to watch what you where doing, I was completely focust on the brush. How you get in to the tiny areas and how you managed to lift exactly the paint where you want. And for my eyes it is a huge brush in small spaces. Great work and I love how you did this, I don’t have watercolour paint but have Distress ink and perhaps that will work to, I give it a try. Thank you so much. 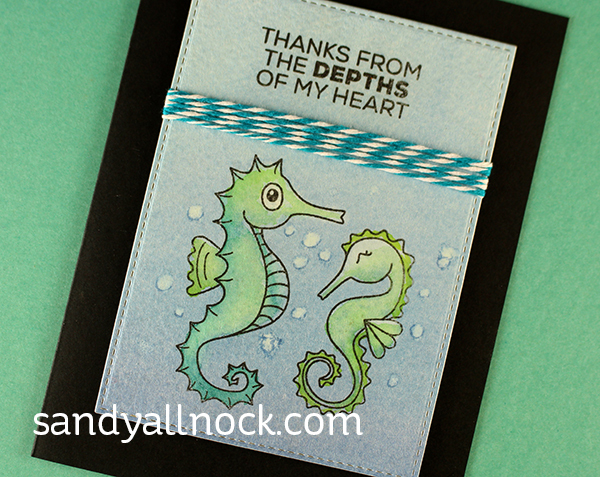 Awesome seahorses card! Thanks for the video! How adorable! Looks just like they’re talking to each other. Lifting the color allowed the remaining blue to blend with the green and yellow, resulting in a realistic underwater critter scene loving it! Cute and simple – love the tip for making bubbles by lifting little dots of “water” out. It’s a rainy day here, so this will be a perfect project to try! I’ll have to look into that flat brush next time I’m shopping at Ellen Hutson’s.